At eight months, your baby probably will be sitting without support. Although she may topple over from time to time, she’ll usually catch herself with her arms. As the muscles in her trunk grow stronger, she’ll also start leaning over to pick up toys. Eventually she’ll figure out how to roll down onto her stomach and get back up to a sitting position. When she’s lying on a flat surface, your baby is now in constant motion. When on her stomach, she’ll arch her neck so she can look around, and when on her back, she’ll grab her feet (or anything else nearby) and pull them to her mouth. But she won’t be content to stay on her back for long. She can turn over at will now and flip without a moment’s notice. This can be especially dangerous during diaper changes, so you may want to retire her changing table, using instead the floor or a bed from which she’s less likely to fall. Never leave her alone for an instant at any time. All this activity strengthens muscles for crawling, a skill that usually is mastered between seven and ten months. For a while she simply may rock on her hands and knees. Since her arm muscles are better developed than her legs, she may even push herself backward instead of forward. But with time and practice she’ll discover that, by digging with her knees and pushing off, she can propel herself forward across the room toward the target of her choice. A few children never do crawl. Instead, they use alternative movement methods, such as scooting on their bottoms or slithering on their stomachs. As long as your baby is learning to coordinate each side of her body and is using each arm and leg equally, there’s no cause for concern. The important thing is that she’s able to explore her surroundings on her own and is strengthening her body in preparation for walking. 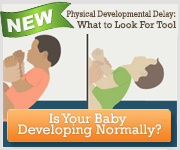 If you feel your child is not moving normally, discuss your concern with the pediatrician. How can you encourage your child to crawl? Try presenting her with intriguing objects placed just beyond her reach. As she becomes more agile, create miniature obstacle courses using pillows, boxes, and sofa cushions for her to crawl over and between. Join in the game by hiding behind one of the obstacles and surprising her with a “peekaboo!” Don’t ever leave your baby unsupervised among these props, though. If she falls between pillows or under a box, she might not be able to pull herself out. This is bound to frighten her, and she could even smother. Stairs are another ready-made—but potentially dangerous—obstacle course. Although your baby needs to learn how to go up and down stairs, you should not allow her to play on them alone during this time. If you have a staircase in your home, she’ll probably head straight for it every chance she gets, so place sturdy gates at both the top and the bottom of your staircase to close off her access. As a substitute for real stairs, let your baby practice climbing up and down steps constructed of heavy-duty foam blocks or sturdy cardboard cartons covered in fabric. At about a year of age, when your baby has become a competent crawler, teach her to go down real stairs backward. She may take a few tumbles before she understands the logic of going feet first instead of headfirst, so practice on carpeted steps and let her climb only the first few. If your home doesn’t have carpeted stairs, let her perfect this skill when you visit a home that does. Although crawling makes a huge difference in how your baby sees the world and what she can do in it, don’t expect her to be content with that for long. She’ll see everyone else around her walking, and that’s what she’ll want to do, too. In preparation for this big step, she’ll pull herself to a standing position every chance she gets—although when she first starts, she may not know how to get down. If she cries for your help, physically show her how to bend her knees so she can lower herself to the floor without falling. Teaching her this skill will save you many extra trips to her room at night when she’s standing in her crib and crying because she doesn’t know how to sit down. Once your baby feels secure standing, she’ll try some tentative steps while holding on to a support. For instance, when your hands aren’t available, she’ll “cruise” alongside furniture. Just make sure that whatever she uses for support has no sharp edges and is properly weighted or securely attached to the floor so it won’t fall on her. As her balance improves, occasionally she may let go, only to grab for support when she feels herself totter. The first time she continues forth on her own, her steps will be shaky. At first, she may take only one step before dropping, either in surprise or relief. Soon, however, she’ll manage to keep herself up and moving until you catch her several steps later. As miraculous as it may seem, most children advance from these first steps to quite confident walking in a matter of days. Although both of you will feel excited over this dramatic development, you’ll also find yourself unnerved at times, especially when she stumbles and falls. But even if you take pains to provide a safe and soft environment, it’s almost impossible to avoid bumps and bruises. Just be matter-of-fact about these accidents. Offer a quick hug or a reassuring word and send your little one on her way again. She won’t be unduly upset by these falls if you’re not. At this stage, or even earlier, many parents start using a baby walker. Contrary to what the name suggests, these devices do not help the process of learning to walk. They actually eliminate the desire to walk. To make matters worse, they present a serious safety hazard because they can tip over easily when the child bumps into an obstacle, such as a small toy or a throw rug. Children in walkers also are more likely to fall down stairs and get into dangerous places that would otherwise be beyond their reach. For these reasons, the American Academy of Pediatrics strongly urges parents not to use baby walkers. A stationary walker or activity center is a better choice. These do not have wheels, but seats that rotate and bounce. You may also want to consider a sturdy wagon or a “kiddie push car.” Be sure the toy has a bar she can push and that it’s weighted so it won’t tip over when she pulls herself up on it. As your child begins to walk outside, she’ll need shoes to protect her feet. They should be comfortable and flexible with nonskid soles to avoid slips and provide room to grow; sneakers are fine. Your child does not need wedges, inserts, high backs, reinforced heels, special arches, and other features designed to shape and support the feet as they have no proven benefit for the average child. Her feet will grow rapidly during these months, and her shoes will have to keep pace. Her first pair of shoes probably will last two to three months, but you should check the fit of her shoes as often as monthly during this formative period. It’s often best to have your infant’s shoes fit by a professional trained in a child’s specific foot needs. Many babies’ first steps are taken around their first birthday, although it’s perfectly normal for children to start walking a little earlier or later. At first, your child will walk with her feet wide apart to improve her shaky sense of balance. During those initial days and weeks, she accidentally may get going too fast and fall when she tries to stop. As she becomes more confident, she’ll learn how to stop and change directions. Before long, she’ll be able to squat to pick something up and then stand again. When she reaches this level of accomplishment, she’ll get enormous pleasure from push-pull toys—the noisier the better.